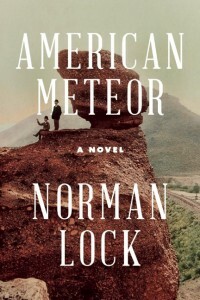 Norman Lock’s novel American Meteor is comprised of the first-person deathbed account of Stephen Moran, whose invented life spans the end of the nineteenth and the start of the twentieth centuries, and includes encounters with many of the great men of the era. He narrates the loss of his eye while fighting for the Union in the Civil war; his subsequent role escorting Abraham Lincoln’s corpse aboard a funeral train, cross-country; a career working for the railroad baron Thomas Durant; a career as a photographer; and encounters with George Custer, Crazy Horse, and Walt Whitman. It is this last figure who appears in the novel most prominently, and whose influence on the course of Moran’s narrative is something like a gravitational pull. Moran meets Whitman at several points in his life, first when he is wounded in battle and Whitman gives him a first edition of Leaves of Grass, after which Moran quotes from the book at key points. Moran lives a life that goes in tandem with Whitman’s poems; like the meteor he compares himself to—as well as Whitman and others (it is a much- and well-deployed metaphor)—Moran careens across the country as the speaker of “Song of Myself” does in his free verse, ricocheting against people and geographies until colliding headlong against the manifest destiny that Whitman’s speaker seems, at times, to speak into possibility. One of the most remarkable things about this novel is the way in which it is so clearly inspired by Whitman, the way it is mindful of Whitman’s America in the nineteenth century, at the same time that Lock is careful not to make Whitman’s influence heavy-handed. For a real-life figure who enters and exits the novel several times, and is quoted throughout, Whitman’s presence in it is at all times eminently plausible. It makes sense, for example, that Moran meets Whitman after being wounded in battle; Whitman met a lot of wounded soldiers. And he doesn’t strike one as a poet who would have been shy about giving away a copy of the book he’d self-published. The America that Lock presents us with is a fulfillment of Whitman’s vision, built to scale, and it seems at times as if the novel were a maze designed according to Whitman’s specifications, one that Stephen Moran unwittingly runs through, one he is not meant to find his way out of but rather to find a place within. Lock makes Whitman’s place in and influence on the narrative seem at all points inevitable—a feat that helps make this novel the admirable thing that it is. Stephen Moran relays a series of harrowing tales from his own life, but with such a consistent strain of doubtful self-reproach that his participation in grand historical events flies under the radar of the reader’s skepticism. Every encounter with a historical figure seems necessary, and it is no small thing, to write a novel that includes scenes from the Civil War, a lament for extermination of the buffalo, seen firsthand, and visions of the atomic bomb, and do it with subtlety. 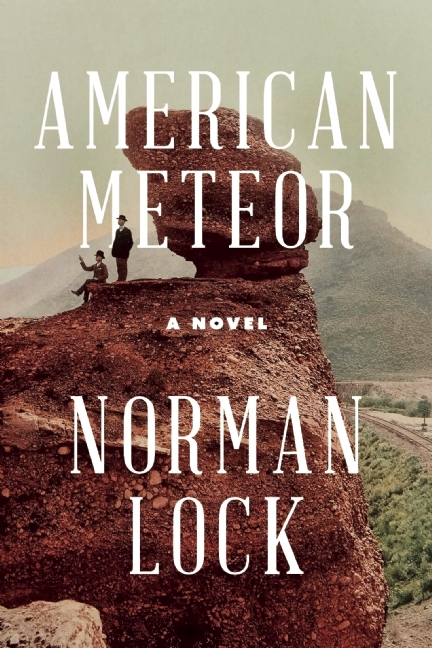 American Meteor is a fascinating, prophetic contribution to recent historical fiction, and Lock is plainly an author well worth our attention. Robert Long Foreman is from Wheeling, West Virginia. His fiction and nonfiction have appeared most recently in Copper Nickel, Fourth Genre, Redivider, the 2014 Pushcart Anthology, and Booth. He teaches creative writing and literature at Rhode Island College, and you can find him on Twitter at @RobertLong4man.